I was going to do a post on my favourite art supplies this week. As I started to photograph them all I realized this was going be a book by the time I was done. :) So I decided to focus on my favourite, painting supplies. At school I use a lot of disk tempera. It's washable, inexpensive, and responds like watercolour. It can sometimes be a bit chalky. (less intense colour). Look for disks that are bright and intensely coloured. I keep colours in isolation and variety trays of 6. Recycled yogurt containers and tuna cans work well. Note: I use a safety can opener, no sharp edges. 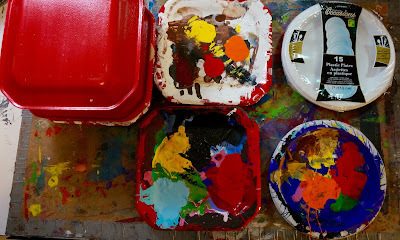 I use the individual containers when I am limiting what colours I want the kids to work with. The easiest way to clean your trays is using a sponge. Run the entire tray under the the tap and give it a quick scrub with the sponge. Drain out some of the water from the wells. 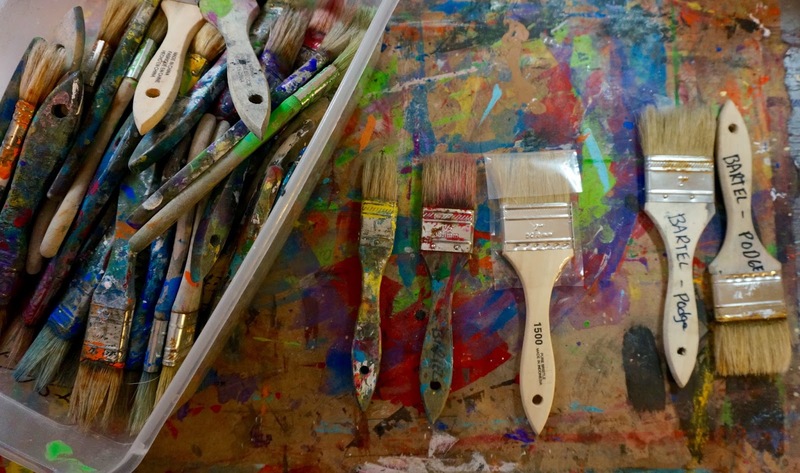 You won't get it all, tip it too much and all your paint disks will wind up in the sink. Leave out to dry. To clean an individual colour, moisten the disk with water and wipe with a sponge or paper towel. 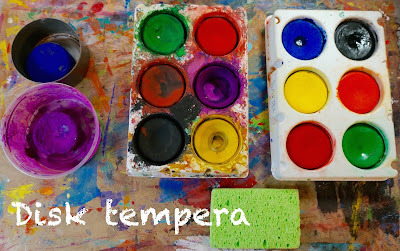 We use liquid tempera as well but I prefer acrylic. I use a ton of acrylic paint. To protect their clothes, every student gets an art shirt, basically a large men's dress shirt with the sleeves cut short. We wear them backwards for extra protection and we only button the top button for easy removal. I have a little talk with the kids about acrylic paint before we start, how "we don't fool around with it as if gets on your clothes it will stay on your clothes". I use craft smart from Michael's. 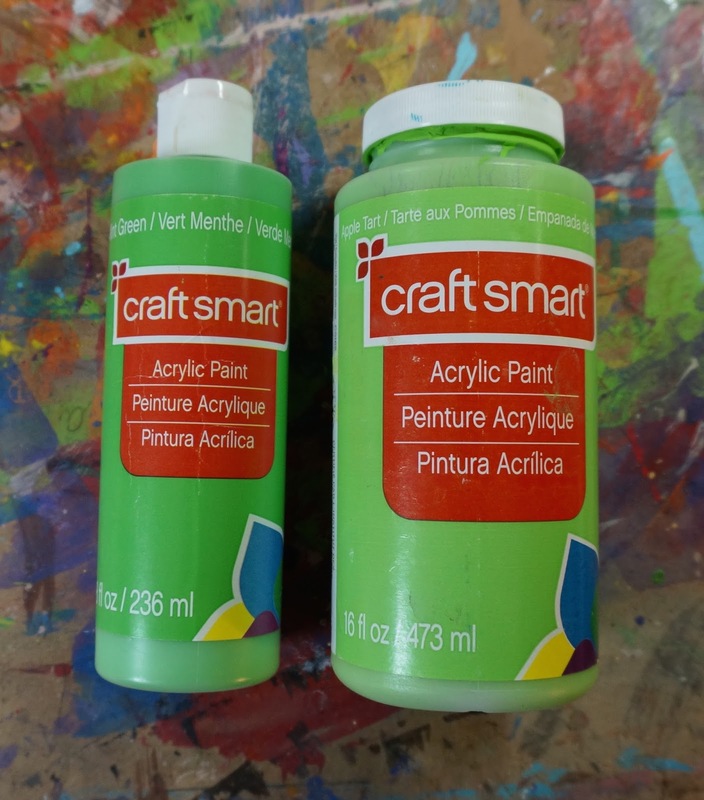 It's marketed as affordable craft paint but it is a really good acrylic. The biggest issue with acrylic paint is opacity. You only want to do 1 coat if you can. There are times you want a transparent look (wash) but you can achieve that by adding water to your paint. I like the bottle on the left with the squeeze top. To keep costs down I will buy the larger size and refill the squeeze bottle. Often I need to add a touch of water to thin it just a bit. There is some clumping but I just remove the clot and keep going. I use foam or plastic plates to hold my paint. They are not good for the environment so I use them over and over. I don't wash the plates. At the end of the day I set them all out to dry and then I reuse them the next day. During the day I stack them by placing one plate on top like a cover and place them in a safe area. With the plastic plates after several layers of paint I can peel the whole shebang off. With thousands of kids I can reuse these plates all year long. 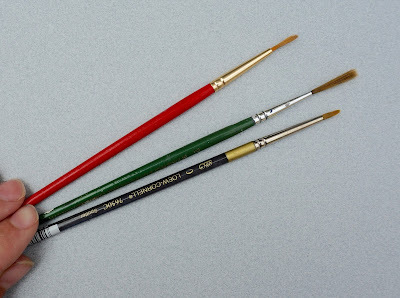 First off, you can always do more with a flat brush than a round. Don't even bother ordering the large round brushes. You want lots of large flat brushes, size 12. A few sets of size 7 and some size 2. I prefer nylon bristle as they keep their shape longer but they are more expensive than a natural bristle. Natural bristle are the most common school brush. They work fine but over time the bristle will start to wear out and break. The flat develops a rounded edge. 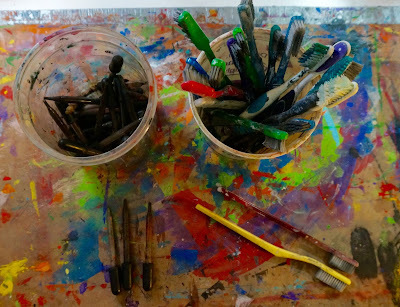 Old natural bristle brushes make great scrubby brushes. There are some effects that can only be achieved with an old scrubby brush so don't throw them out. Every year I buy new sets of fine round brushes. Kids are very hard on fine brushes so they don't last very long. I move from school to school so I store my brushes in long plastic containers. 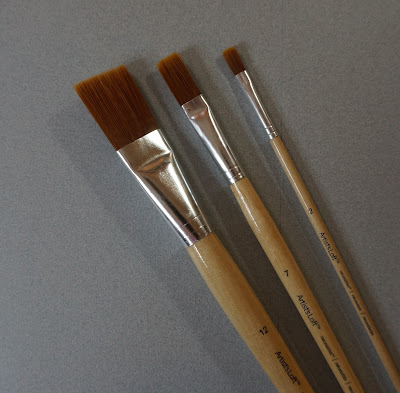 If the brushes are wet make sure to open those containers and let them dry out. If you have a brush with a loose ferrule don't throw it out reattach it with a glue gun. I also buy these cheap sealer brushes in the hardware store. They are meant for one use only when you apply polyurethane/sealer but are great for kids. They have a short handle and are big so we get more paint down in a faster time. 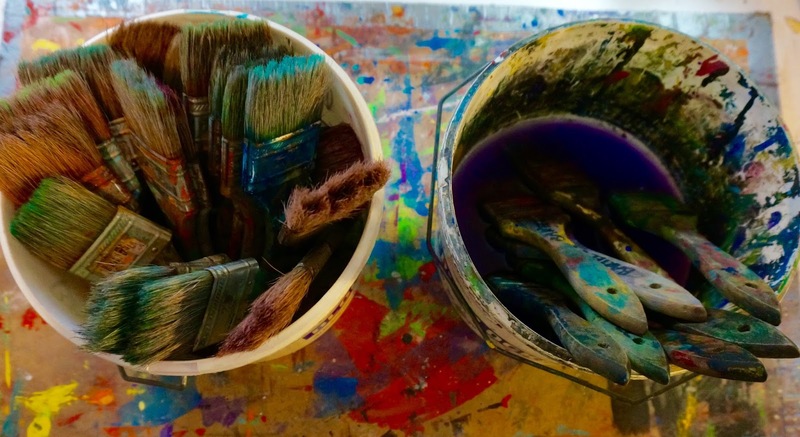 Many techniques require wet paint....if you have a small brush it takes forever and the paint is dry long before you finish. I also keep a set for podge/sealer. I label them so there is no mix-up. If you use a regular brush you can get traces of paint staining your podge/sealer. These brushes will last for years. As they get beat up we tend to use them for basecoating or background painting. I use a bucket system for washing. 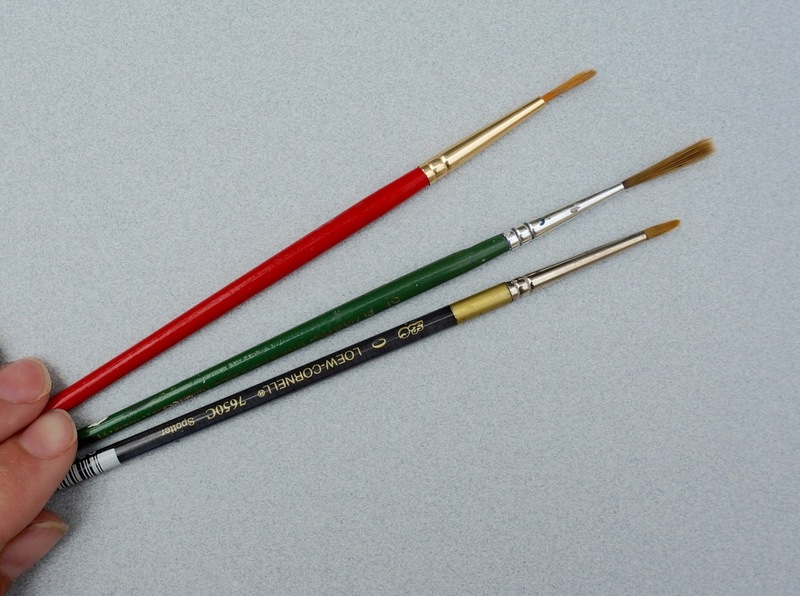 Any large brushes or brushes we used for acrylic painting will get a once over by me. 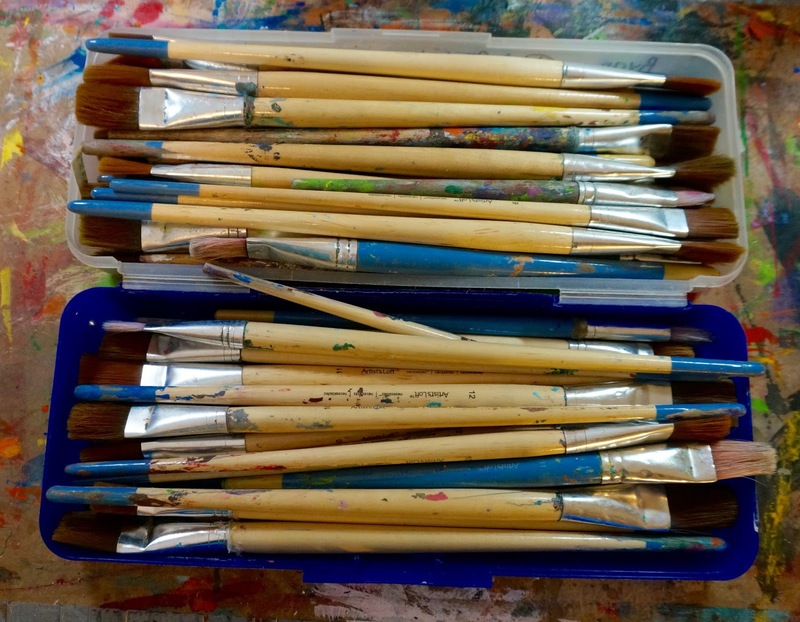 I have hundreds of brushes and I have to be pretty vigilant regarding their care. 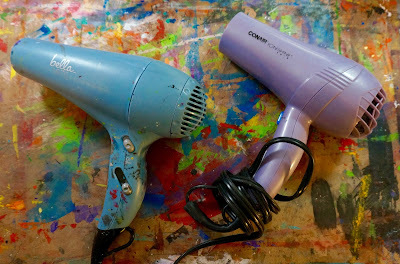 I hold my dirty brushes, "hairstyle down" thru the day in a bucket with about 3 inches of water. When I have a moment I wash them. My secret weapon..... good old Ivory soap. At school I can go thru 1 bar a day! To keep brushes in good shape you should only brush them back and forth on the soap but I would be lying if I said I never used a circular motion....sometimes you gotta do what you gotta do. When clean I put them "hairstyle up" in the bucket. Never store brushes bristle down. At home I sometimes use brush cleaner. You can sometimes rescue a brush (dried up acrylic) by smearing brush cleaner on it and wrapping it in plastic wrap. Let it sit for a couple days and then wash. 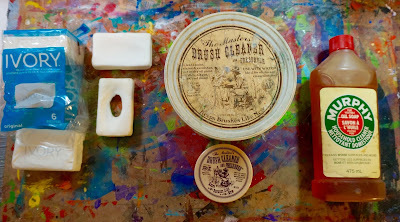 I have also used Murphy's oil soap to clean and rescue brushes. Note: Do not use soap on your podge/sealer brushes. This causes the sealer to become foamy. I always have a few water sprayers on me. I use them to add water to paint on the palette in creating washes or just to thin it down a bit. I also spray water on paint that we have painted if it is getting too dry. For example we want to lift some clouds but our sky has dried or we want to mingle some acrylics and they are drying too fast. 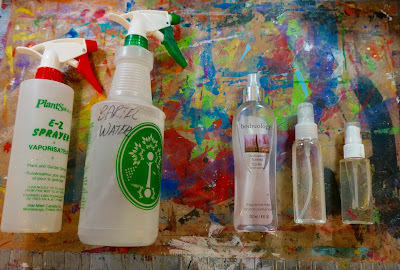 We also spray to get blooms and spatter effects on disk tempera and watercolours. I buy green painter's mask in the bulk pack. I use it to tape off paper we are working on. It creates a nice white border or mat effect for display and it holds the paper down while kids are painting. 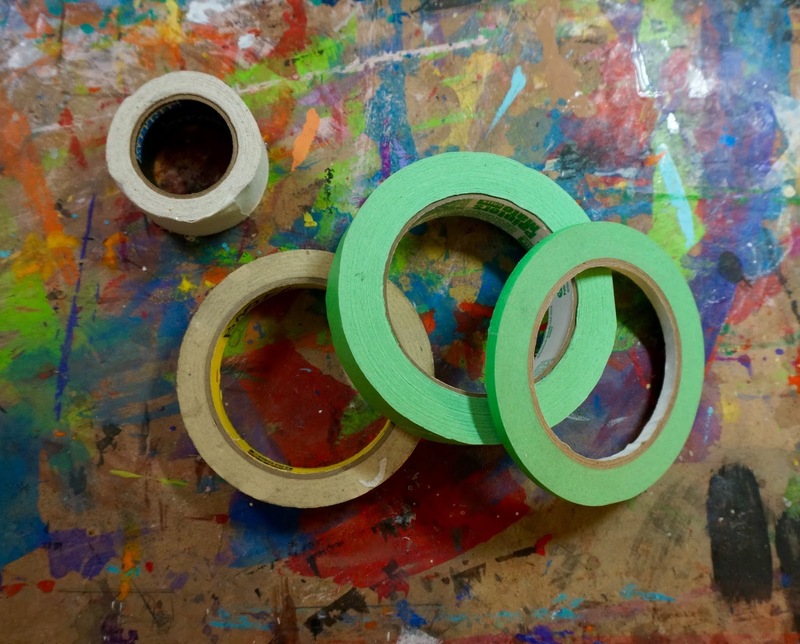 Regular masking tape tends to be too sticky ripping the paper when you remove it. Hair dryers are used for drying projects. 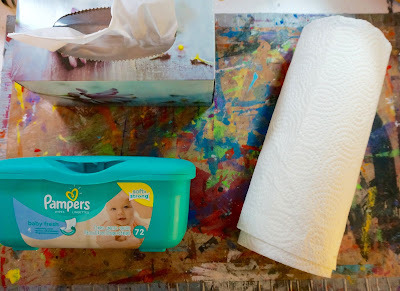 You be surprised how effective diaper wipes are for cleaning acrylic paint. I also have collections of toothbrushes, eyedroppers, sponges, stamps, scrapers, combs, and printmaking tools that we use for painting. 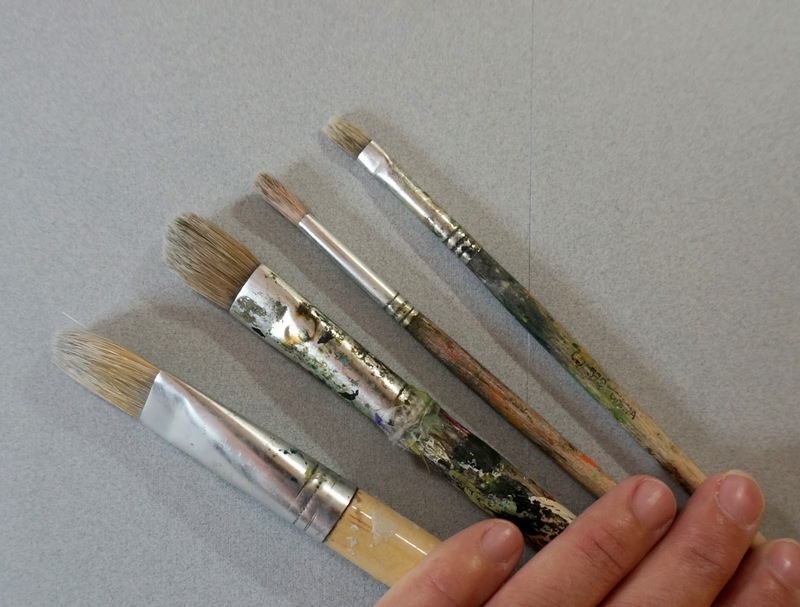 Substrates can vary but we use a lot of canvas, canvas board, watercolour paper, heavy paper, cardboard, wood, hardboard, and recycled paper. Working on more projects to post.......see you next time. Great info, saves me time & money, thank you.